It is no wonder we are called the rainbow nation, with our abundance of cultural symbols and artwork showcasing a most interesting history. SA Post Office has done themselves proud with such a beautiful representation of our cultural diversity. South Africa has a rich and diverse cultural history that goes back thousands of years. Throughout the years, the different cultural groups have communicated their traditions, beliefs and social customs in a variety of forms such as religious objects, utensils, artefacts, clothing and accessories. Many of these have remained intact to tell their stories to this day. On 20 September, the South African Post Office will issue a set of 10 Stamps featuring some of these fascinating historical symbols. Every object created by one of South Africa’s cultural groups conveys a message that tells us something about the culture they represent. All of these objects are decorated with certain patterns and colours, which have a specific meaning and are unique to South Africa. According to Dr Johnny van Schalkwyk, anthropologist at the Ditsong National Museum of Cultural History in Pretoria, those symbols or patterns work together with the object to tell their own story. 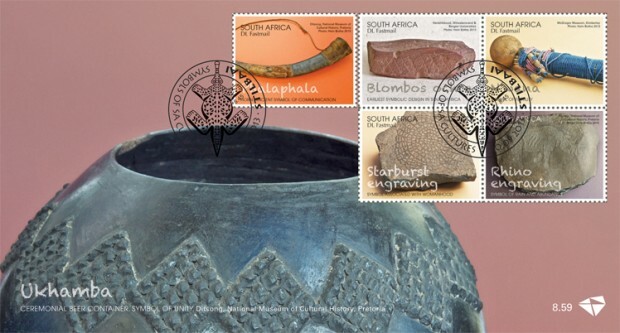 “If you should take those away from the object, it will not have the same meaning,” says Dr Van Schalkwyk, who assisted in choosing the objects depicted on the stamps and provided information about them. They were photogrpahed by Hein Botha. The oldest symbol in South Africa – nearly 75 000 years old – was found in Blombos Cave on the southern Cape Coast. Acknowledged as possibly the earliest symbol of communication in the world, it was unearthed by Professor Chris Henshilwood in 2000. This engraved fragment of ochre represents evidence of the earliest symbolic behaviour of human beings. The cross-hatched, diamond-shaped rows of engraving were carefully made with a sharp instrument to communicate ideas to fellow humans. Rhino engravings occur frequently at rock art sites in South Africa and significantly at Wildebeestkuil near Kimberley. In the belief system of early hunter-gatherers, the rhino was associated with rain-making – by symbolically harnessing the large water-loving beast they ‘led” it through the sky to the place where rain was required. A wealth of rock engravings was made on glacially smoothed rocks in the bed of the Gumaap, now called the Riet River, at Driekopseiland, in Later Stone Age times. These have been subject to more than a century of speculation and research by various visitors including archaeologists and rock art specialists.The starburst or sunburst is a common motif in rock art and in body and clothes markings. Adornment is about symbolic communication. The beads excavated from the Blombos Cave site in the southern Cape represent the earliest and oldest evidence yet to be found for ornamentation in southern Africa. These intentionally bored estuarine shell beads are 75 000 years old They were strung and worn around the human body, communicating a message about the wearer to viewers – perhaps about age, status or authority. Applied, carved or cast patterns of rows of raised geometric bosses called amasumpa (from the word for warts in isiZulu) were used as a decorative device on personal and domestic objects in the Zulu Kingdom at least since the early 19th century. Found on brass arm gauntlets, wooden meat platters and ceremonial vessels, headrests and ceramic beer containers, this pattern is believed to have symbolised the number of head of cattle in the households of royalty or chiefs; it was therefore a symbol of their wealth. One of the most common forms of traditional figure representation in South Africa is the child figure. Used by young women as they reached puberty or before marriage, the figures confirmed their preparation for marriage and that they had undergone the necessary instruction to equip them for this role. Created as a stylised version of a woman in full ceremonial costume, the nwana also represents both the desire for a child and a mature Tsonga woman. Groote Schuur, Cape Town, collected for Cecil Rhodes. Sacred objects (dzingoma) of the Venda people include the crocodile motif (ngwenya) signifying the power of the chief at the centre of his court, like the crocodile in the centre of his pool. Divining bowls (ndilo) were made up until the end of the 19th century for traditional healers in the courts of Venda kings and were used in cases involving death by witchcraft. The bowl was filled with water to immerse the crocodile as though in a pool of water. A low-fired beer pot, burnished or decorated with engraved patterns or applied bosses symbolises the communal act of sharing traditional beer made from sorghum. Beer forms an essential part of offerings and sacrifices to the ancestral spirits. It is believed that the act of honouring the ancestors through beer will appease their spirits and bestow good fortune on people. community. White also identifies community members in a special or liminal state, such as nursing mothers or young male initiates undergoing rituals associated with important stages of life. The horn, or phalaphala is a music instrument that was used only on special occasions, such as when the chief announced a pitso or tribal meeting, when danger threatened the community or during rituals such as rainmaking ceremonies. It could only be sounded by specific persons on the request of the chief and everybody was obliged to react to this summons. 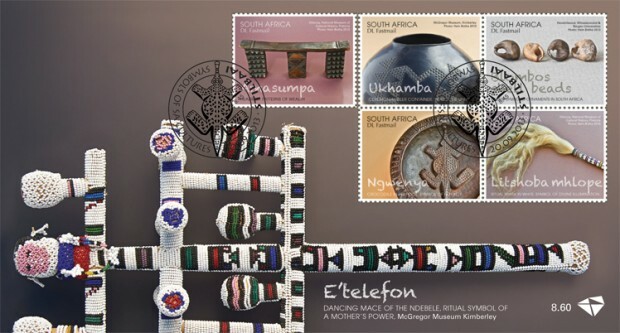 The two commemorative covers depict a ceremonial beer container (ukhamba) and a dancing mace of the Ndeble respectively, both from the McGregor Museum in Kimberley. The mace is a ritual symbol of a mother’s power. Innovative Ndebele women artists have adapted this traditional symbol into a symbol of mid-20th century rural communication – the telephone pole (e’telefon).